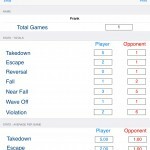 Good app to track and manage important wresting games and practices. Useful for players and opponents. 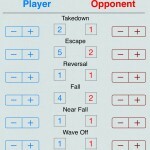 Tracks in the local database: Takedown, Escape, Fall, NearFall, WaveOff, and Violations. No network connectivity required to use this app. 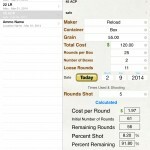 The Ammunition app is a straight-forward, no-nonsense record keeper for tracking ammunition in Inventory and Storage with statistics for both built-in. 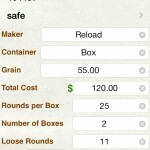 Sort ammo records by Ammo Name, Location and Date. Each record will allow you to track the following information: Record Date, Ammo Name, Location, Maker Name, Rounds, Cost, Container, Grain, Ammo Shot, Cost per Round, Remaining Rounds, Percent Shot, Percent Remaining, and Notes. Tracking for the Ammunition and Location is provided using Statistics. Statistics = Averages: Cost, Number of Rounds, Rounds Shots, Cost per Rounds, Remaining Rounds, Percent Shot, and Percent Remaining. 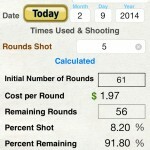 Statistics = Totals: Cost, Number of Rounds, Rounds Shots, and Remaining Rounds. No network connectivity is required. 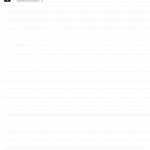 This app works with local storage. 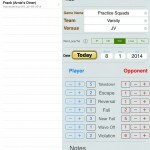 This is a good app for tracking your pitching speed as well as taking notes on your training progress whether for an individual pitcher or a series of pitchers. Throwing speeds are recording in MPH and feet per second. 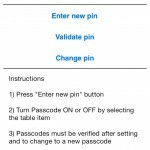 All of the above information is stored in the App’s Database for later recall. 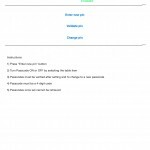 Additionally the pitcher’s name, practice/game name, and individual pitching notes may be stored, retrieved, and sent via email.